Authors: Wei-Dong Zhu, Satya Bhamidipati, Elena Bogdanova, Toralf Gerstaecker, Ryan Lott, Donald L Wilcox Sr. In today's business environment, e-mail has become one of the most commonly used forms of corporate communication. It is one of the core tools to conduct business transactions, and it generates a significant volume of critical business information including business discussions, decisions, and important business documentations. To manage the increasing volumes of e-mails, and to ensure long term e-mail retention, and provide discovery capability when required has become a real challenge that every organization faces today. IBM CommonStore for Lotus Domino V8.3.1 and IBM CommonStore for Exchange Server V8.3.1 manage e-mail archiving and retrieval. With IBM eMail Search for CommonStore, they help to provide a solution that ensures e-mails are retained for a specified time and that they are full-text indexed and available to be searched when required. 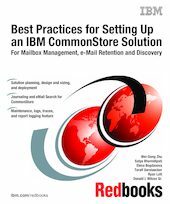 This IBM Redbooks publication provides guidance on setting up CommonStore solutions for mailbox management or long term e-mail retention and discovery purposes. We cover the topics including solution planning, design, sizing, deployment and configuration. We discuss journaling and eMail Search. We also discuss maintenance, troubleshooting, logs, traces, and the new report logging feature. Although we do not have all the best practices in setting up CommonStore solutions, we provide some of the known practices and information that we collected at this point. This book serves as a starting point for you to explore ways to set up successful CommonStore solutions. Use this book in conjunction with the existing product manuals and solution documentation.